The Career & Technical Institute (LCTI) is home to two schools, the Career and Technical High School and the Adult Workforce Education School. LCTI’s mission is to prepare all students for successful careers through hands-on learning, real world experience, and state of the art training. Like other educational institutions, LCTI needed its website to be a hub of information for current and prospective students, parents, and staff members. They had the unique challenge of being home to two very different schools. This required LCTI’s website to appeal to both young students and adult learners while leading each audience to the right information. SmartAcre worked with LCTI to create an engaging new site that is user-friendly and responsive. The new site gives the audience a look into the student experience. All internal content was transferred to LCTI’s Intranet to keep the public site external-focused. Because the site is built on a responsive framework, content management is easy and only needs to be done once. 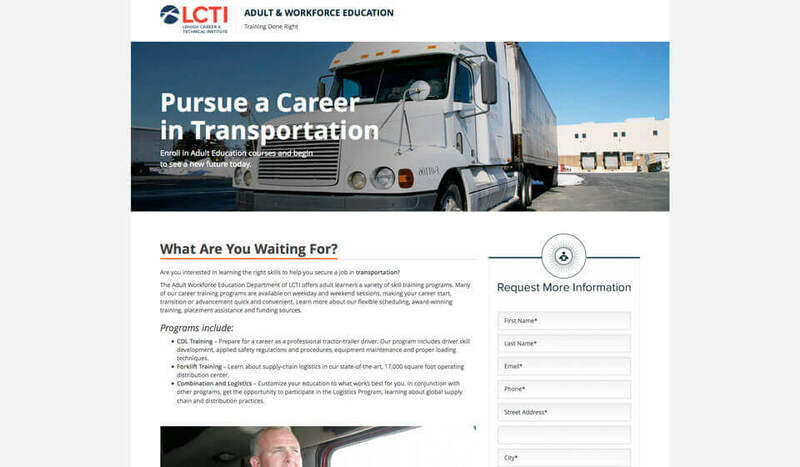 LCTI staff use the site to share class details, photos, videos, and career opportunities. SmartAcre created PPC campaigns in AdWords to drive traffic to the new website and increase enrollment in adult education courses. Heatmap data reinforced the need for PPC specific landing pages that eliminated multiple click opportunities and visually drove the user to complete the form and become a lead. SmartAcre designed and developed new landing pages with keyword specific content and a streamlined design. Within just one moth, the landing pages more than doubled the amount of leads and reduced the cost per conversion by 57.81%.